Trevin, Curbside Express Team Member at the South Hills Market District in Bethel Park, PA! How did you come to work for Giant Eagle? And what do you do on a day-to-day basis? My first day on the job was February 18th. I’ve been here for a little over a month. I worked with Giant Eagle’s Inclusion Specialist during the interview process here, and then Human Resources called me to let me know they wanted to make me a job offer. I was very excited. I’ve been working Curbside Express for the past month. It’s a very fast-paced environment. In Curbside, we listen to what the customers order online. We pick up what they want, and we bring it back on a completed trolley. We use different bins for different types of products, and then when the customers come in to pick up their order, we take the orders out to their cars. What do you love about working at Market District? I love the technology that we use because it almost makes my job feel like a game of sorts, but more important than that, I love giving great service to our customers. Sometimes when I’m picking an order, customers will ask me where a product is located, and I like being able to tell them exactly where they can find it. When you work in Curbside, you learn the store like the back of your hand. I tend to have an easier time with remembering things, which helps. I’m most proud of having a job right now. I feel normal, and I feel like my family is very proud of me too. It’s a wonderful feeling. My mom and dad have worried about me over the years with just trying to fit in. It’s been an uphill battle most of my life. I’m very proud to have this job and I don’t plan on going anywhere anytime soon. What challenges have you faced, and how have you worked to overcome those? I found out when I was around 9 years old that I was autistic through testing that was done at one of the local hospitals. I found out that I have high-functioning autism, also known as Asperger’s Syndrome. I was about to go into middle school, which was a very difficult time in my life. I was bullied a lot during middle school, which was very challenging. I was given some extra resources to help, for example, I was in Autistic Support Classes, which was a good resource for me. I ended up graduating high school with a decent GPA, and when I went off to college it was very stressful at first. I started buckling down and did what I needed to do. It felt so good to prove everyone wrong. I matured a lot during college. It was the best years of my life. 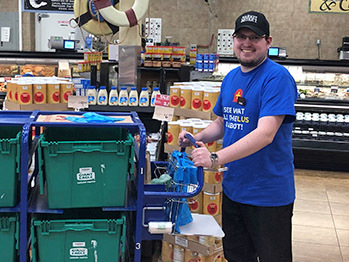 What advice would you give to someone with autism that is looking to work for Giant Eagle? For someone like me who has been diagnosed with high-functioning autism, I would recommend they look for something within Curbside Express or the Front End. Curbside is great because it’s fast-paced but it’s a great experience and your interactions with customers are brief. My days go by very fast and it’s given me something to be proud of. Introducing Giant Eagle’s Recruitment Marketing Dream Team! Meet Melanie, Sr. Store Leader at the NEW Monroeville GetGo Cafe + Market!